Please consider attending the two drone workshops scheduled at Kearney April 13th and April 14th 2017. UC ANR Kearney Agricultural Research and Extension Center (KARE) will be the location for two related drone workshops. The goals of these workshops are to provide an overview of unmanned aerial systems (UAS) technology and best practices for data collection, and an insight of drone regulations and data processing to affiliates of the University of California Division of Agriculture and Natural Resources (UC ANR), as well as public and private resource professionals. Drone Technology and Data Collection, Thursday, April 13th, 2017, 11:00am to 4:00pm. This workshop will provide an overview of unmanned aerial systems (UAS) technology and best practices for data collection. It is designed for participants with little to no experience with drone technology, who are interested exploring practical applications of drones for a variety of data collection interests. The workshop will begin with a lecture on drone technology, and considerations for flight planning and deploying your drone. We will then go outside for a drone demo, where we will be joined by Green Valley International who specializes in LIDAR drone applications, for some hands-on experience with flying a variety of common quad-copter platforms. To conclude the workshop, we will discuss a wide variety of potential scientific and management oriented applications for drones, and associated mission specific considerations. Click here to register. Drone Regulations and Data Processing, Friday, April 14th, 2017, from 10:00am to 3:00pm. This workshop is designed for participants with little to no experience with drone data or GIS software applications. Following a brief lecture on regulations and how to prepare for the FAA Part 107 Remote Pilot License test, hands-on exercises will introduce you to the steps you will need to know for processing drone imagery and Lidar data to create your own maps. To conclude the workshop, we will compare the various types of data that can be collected by drones to identify the advantages of each data set for different research and management interests. Click here to register. File photo of a previous drone workshop. Riverview 6th grade science students visit Kearney to learn how we advance agriculture with science. 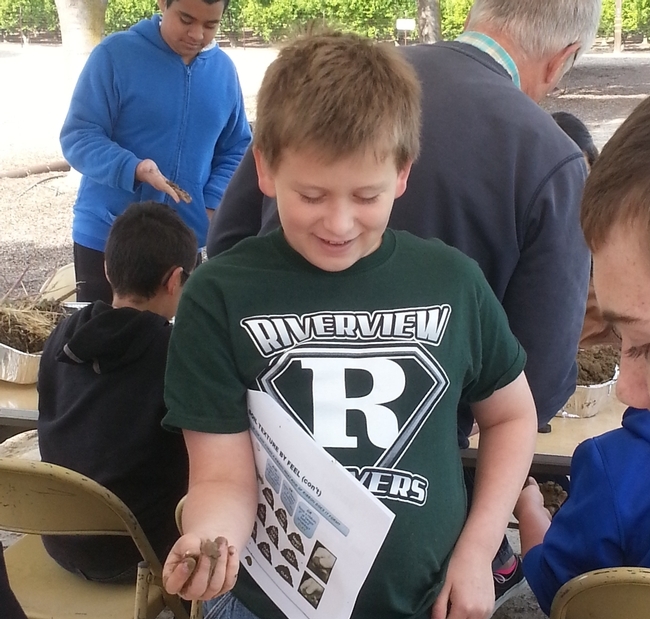 April 9, 2015, Riverview 6th grade science students attended workshops on nematology, conservation agriculture strategies, and integrated pest management. Students were exposed to issues that they could work on if they chose a career pathway resulting in working in a science, technology, engineering and/or math field related to agriculture and natural resources. Nematology workshop: Andreas Westphal, UC Assistant Cooperative Extension Specialist at UC ANR Kearney Agricultural Research and Extension Center and in the Department of Nematology at UC Riverside and specializing in pathogens and nematodes affecting plants, increased student awareness of the impact of nematodes. Tom Buzo and Fen Westphal assisted with the workshop. Students learned about the diversity of nematodes in the world; that there are good, bad and very bad nematodes. Westphal works on nematodes that are bad for plants. Many of these feed on plant roots. Students used microscopes to see some easily recognizable nematodes that were dug up from the soil. Soil Health workshop: Jeff Mitchell, Cooperative Extension cropping systems specialist at the UC ANR Kearney Agricultural Research & Extension Center and in the Department of Plant Sciences at UC Davis specializing in vegetable cropping systems, irrigation management, soil quality, organic soil amendments, extension models, and postharvest physiology provided a workshop on soil health. Students learned that we will have an additional 3 billion people by 2050. This leads to the problem that the estimated food production demand from 2010 through 2050 will be more than it was for all of history. So, just like caring about our own health, we must care about the health of our natural resources. We are in a race to see if we can improve our food production and have sufficient water to meet the demands of a larger population. Mitchell had samples from an ongoing long-term trial that compares soil quality and yields using conservation agriculture strategies versus traditional tillage practices. Students noted that the conservation agriculture soil samples had more organic matter and held its shape while absorbing water when placed in the water. They noted that the traditional tillage soil samples had low organic matter and fell apart when placed in water. Integrated Pest Management (IPM) workshop: Laura Van der Staay, Field Research Supervisor 2 at UC ANR Kearney Agricultural Research & Extension Center, provided students with the basic concepts of IPM, with role playing to better understand how effective IPM strategies are at sustaining our food, feed, and fiber production while protecting our natural resources. One of the role playing scenarios was to see how different modes of action can help reduce pesticide resistance in pest populations. Students got the extra treat of seeing some great horned owls (part of nature's IPM) that hatched at Kearney, as well as bones and feathers in the owl pellets. Joshua Bowe and classmates using microscopes to see nematodes recently collected from the soil. Joshua Bowe using the ribbon test to determine the texture of a soil sample. 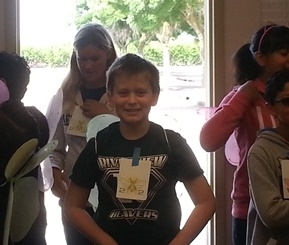 Joshua Bowie and classmates pretending to be aphids in a pesticide trial. 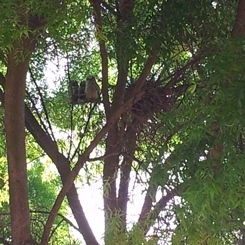 Three great horned owls almost old enough to fly. 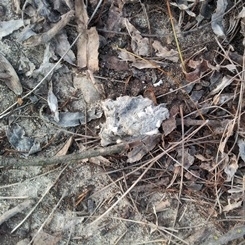 An owl pellet that was stepped on, showing the bones and feathers of animals caught by great horned owls at Kearney.